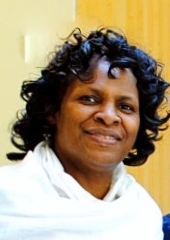 Pastor Beverly J. Renford was born the seventh of fifteen children to the late Bishop Samuel I. Rumph Sr. and the late Elect Lady Priscilla M. Rumph on August 11th 1958, in Detroit Michigan during the Civil Rights Movement. At the age of five God impressed Beverly’s heart and began to call and teach her His voice. She repented and was baptized in Jesus name by her father; and received the infilling gift of the Holy Ghost evidenced by speaking in tongues as the spirit gave utterance, at the age of eleven with her mother by her side. For many years she worked alongside her parents in their ministry of the Greater Bethlehem Temple Pentecostal Church. She has held various positions such as being a faithful church member, Sunday school teacher, secretary of finance, usher, choir director, musician and teacher of women’s issues. Many times she has been heard to say, “Momma and Daddy introduced me to their God, but I took it further and now He’s my God”. She graduated from Penfield High School in 1976 at the age of 17, as a recipient of the Urban Suburban program. On August 22, 1981 she and Bro. Mark A. Renford were united in holy matrimony and to this fruitful union eight children were born. Seven girls: Brooke, Bridgette, Rachel, Nicole, Courtney, Anastasia and Markaysia. One son Benjamin: two sons in law, Stephen M. Drummond and Minister Richard A. Harris: one granddaughter, Shiloh and four grandsons, Brayden, Bryan, Preston and Sage. She is currently enrolled at SUNY Brockport College pursuing an Early Childhood Education degree, holds an Associates degree from Monroe Community College, holds a CDA, is a graduate of PLTI (Parent Leadership Training Institute) and holds licenses and credentials in various professions. God called her to the ministrations of preaching and teaching in 2001, and since answering has not looked back. Endorsed by her father, she received her official ordination in August 2013 at the P.C.A.F National Convention in Jackson, Mississippi. As Pastor of the Greater Bethlehem Temple Pentecostal Church, her husband Elder Mark Renford and family work with and alongside her and strongly support this profound ministry. Armed with her passion and her sincere love for people, Pastor Beverly Renford has availed herself to serve the community, to lead others and to share the message of the Gospel to the Nations.